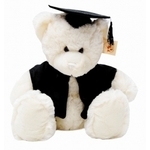 16cm Boxed Graduation Bear | Graduation Bears and Gifts at discount prices! 16cm cream coloured graduation bear with tan feet and ears wearing a black cape and graduation cap. The cap has a golden tassel and the bear carries a white graduation certificate tied with a pretty red ribbon. Perfect size for pre-schoolers and kindy kids.